The Office-Bag QL3.1 is a spacious briefcase with the bonus of having an innovative rack mounting, QuickLock3.1. It allows even more comfortable and quicker mounting of the pannier. Simply insert into the lower mounting element, move towards the rack and slide into the top hooks by a lateral motion from left or right. The hooks lock automatically and disengage by lifting the bag. The QL3.1 mounting set features three attachment points and can be mounted to any standard rack. Height and angle are individually adjustable. The mounting components on the bag‘s rear side are flat leaving the bag‘s back uncluttered, ideal for use in daily life. 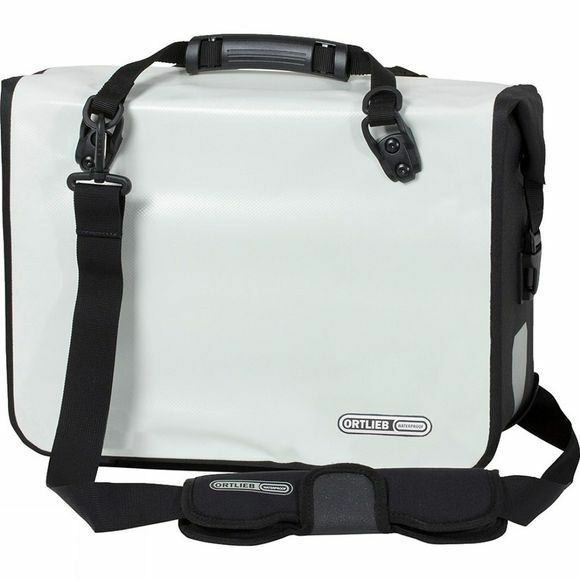 Office-Bag QL3.1 features a waterproof and dustproof roll closure for safe transport of files, laptop, paperwork, etc. Two internal organizers help storing and organizing items inside. With 21 L volume (size L) the briefcase is suitable for A4 documents and a laptop plus all other little items required for a day at work or school. Base feet and edge protection safe the bag at the bottom and at lower corners respectively. The ergonomic design of the removable shoulder strap prevents sliding of the bag off your shoulder. Two large reflectors provide additional safety in dawn and at night. Size ideal for 2 large office files, cell phone etc.